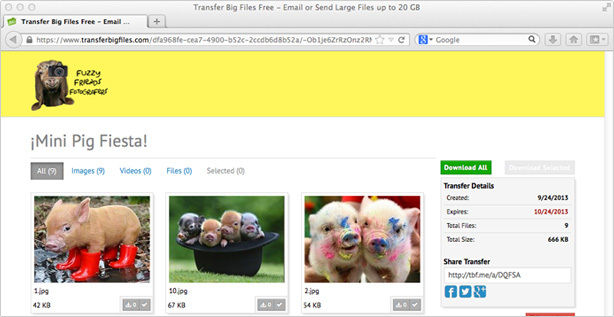 TransferBigFiles is the easiest way to send and receive files. TransferBigFiles is just what you need when you’re trying to send and receive files that are too big for email attachments. You can send up to a whopping 20 Gigabytes, whereas most email systems max out at 10 to 25 MB. Paid accounts can send files up to 20GB in size. Send files that are too BIG for email! — up to 20 GB! 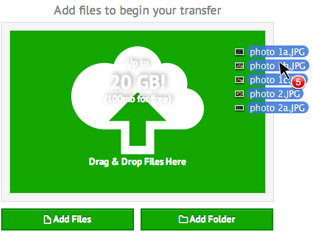 To create a new transfer, simply add your files and folders to the files panel. Your files are instantly uploaded to our secure servers and a new transfer page will be created. Whether you're sending proofs to a client or transferring pictures of cute animals, it’s essential to create a consistent customer experience. 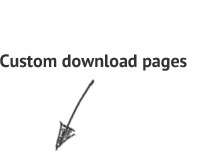 That's why our latest update to the Team and Business plans adds the ability to fully customize email templates and download pages to match your company's image. Use Upload Widgets to Receive Files on Your Site or Blog. Some of our premium plans include 1 or more Upload Widgets that allow you to receive large files directly on your web site or on a custom TransferBigFiles.com URL. Easily customize the fields you require and use any of 24 themes to match your site's style. Get notified when recipients download your files. 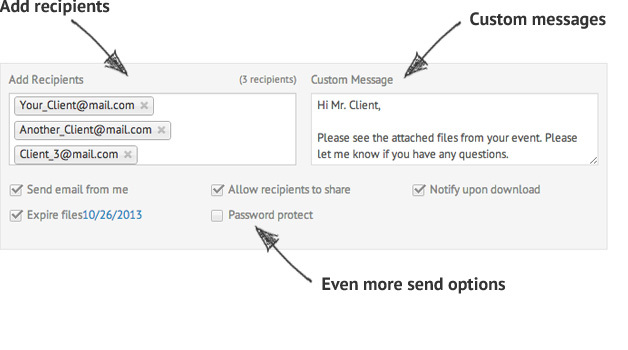 With email attachments, it’s impossible to say whether your recipient(s) actually downloaded the files that you sent. 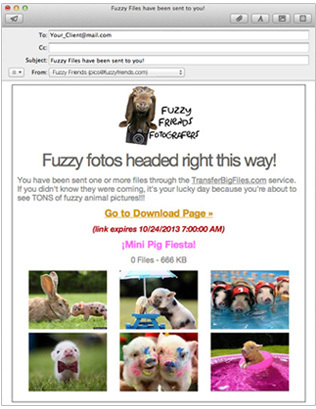 With TransferBigFiles, each recipient receives a unique download address. When they download the file, you’ll know. You can add & manage your contacts from "My Account > Contacts" section when you are logged in. Add a new contact by clicking the plus icon (+) in the toolbar above your contact list, or select an existing contact to edit their details. You can also create a group to categorize your contacts using the "Add Group" button in the left column. You can add & manage your users from "My Account > Users" section when you are logged in. Add a new user by clicking the plus icon (+) in the toolbar above your user list, or select an existing user to edit their details. Users will have access to to your account for sharing & sending files, and can have access to different areas of your account (e.g. General access, Upload Widgets, Administrator). Transfer files up to 20 GB! We have the largest Transfer bandwidth there is. Create, upload & send without worrying about your file size.